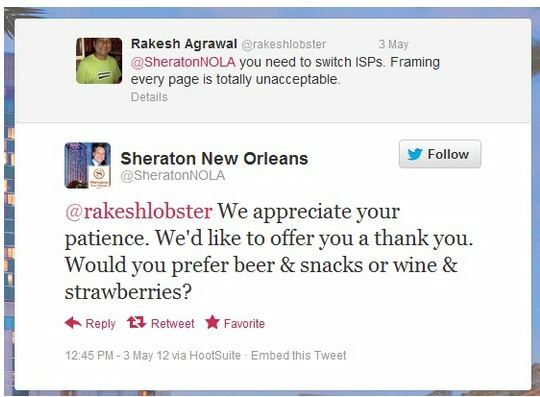 Starwood: social media customer service done right — or, has SM eaten our brains? Starwood: social media customer service done right | VentureBeat. This story is bizarre on so many levels I can hardly start. Without reading it, although it’s worth the read, the short form is: boy goes to hotel, hotel internet slow, boy tweets hotel that internet is slow, hotel sends wine and chocolates. Boy then writes comment on Venturebeat. So, what’s wrong with this? First of all, why is it that if the internet is slow — or, let’s say doesn’t work, or perhaps the toilet is broken — and the guest calls down to “guest services,” or “anywhere, anytime,” or whatever, the best that happens is that the internet gets fixed (and maybe, just maybe, on a good day, in the summer, when the sun shines, the hotel will waive the daily internet fee for one day), or the toilet gets fixed, and that’s the end of it. But when it’s tweeted, no matter how minor the transgression, the hotel spends real money to give wine and bon-bons to the poor, suffering guest? (sorry, long sentence, tweet me and I’ll send you something to make it all better). Are we really moving into a world where customer service is only available on the threat of global humiliation by means of twitter? I know of people who have this figured out and rather than fill out comment cards, tweet their comments to the world in general, certain that they will get a quick response and some disproportionate compensation. Hell, I know of people who do this even when there is nothing wrong with the service or accommodation, simply so they can get another 300 or 400 SPG points or whatever. Then, they negotiate the number of points on Twitter. As you can see, the offer from the hotel was beer and snacks (shabby chic!) or wine and strawberries (traditional decadence). Rakesh (if I may call him that) asked for wine and strawberries. The hotel delivered, wine and chocolates! Hello! Whatever it is, it will lead to tears. Mark my words. Hand over your tips or else, posh Muskoka hotel warns staff – thestar.com. The latest exercise in near fatal brandicide committed by the Rosseau Muskoka (Ontario) Marriott offers interesting lessons to all of us, on many levels. The story is quite usual:” posh hotel needs money, sees opportunity, grabs it, thinks”. The somewhat sordid details, that the hotel saw the opportunity in the tips of a certain class of employees (spa staff — not even much money there) and determined to make a grab for them, are perhaps less usual, especially given the reality that this would reduce the income of the staff. Or that it would convert a voluntary gratuity into a mandatory 20% add-on to the price (plus sales tax, which brings what is an effective price increase to 23%, if my math is right — this kind of price increase by stealth is anathema to consumers, but more on that another time). We don’t need to go into the bizarre executional overtones (sending the employees a letter saying they are welcome to quit of they don’t like it…hello? ), or the timing (a private-member’s bill is sitting in the provincial legislature — State Assembly — to forbid hotels and restaurants from pooling tips, sharing tips out with other classes of employees or taking a small admin fee for processing tips on credit cards — Premier Dalton McGuintyseeks a ban on “tipping out” to the boss.). What is particularly interesting is the medium! The story was based on a tip (no pun intended) received by a daily newspaper; it was published in a daily newspaper and took on a life of its own in a daily newspaper. The Star has a daily circulation something north of 600,000, so it is no surprise that the front page article was noticed. And here’s the lesson: do not forget the power of traditional media! While dozens of Marriott denizens were arduously watching the twitter sphere so they could nip threats just like this in the bud, they overlooked the traditional media. Clearly no plan was in place to deal with the negative upshot (while, I bet, much thought had been given to the question of how to deal with the negative backlash in social media). But the damage that the front page of the daily newspaper seen by 600,000 plus people can do is quantitatively greater than the damage even millions of tweets can do. Why? Because social media can be managed. 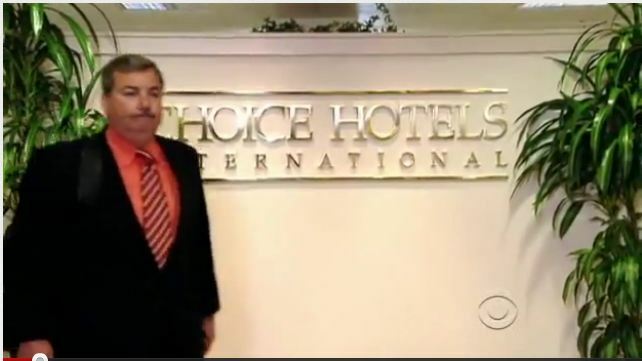 The hotel, or the brand (should they wish to distance themselves from this, as, in this instance, they should) can direct information, explanations, loyalty points and all kinds of mitigations, directly at the people who are interested. Unfortunately, the people who are interested, the people who tweet about this stuff, are not the people who count — very few of them could or would spend $300/night in a hotel. The people who do buy $300 night hotel rooms see the newspaper headlines, even if they don’t read the stories. People tweet from their slow thinking brain — that is, they tweet as a result of rational thinking. But people judge hotel brands in their fast thinking brains: judgement, response, brand evaluation, whatever we call it, is not rational. It is an outcome of myriad information sourced consciously and unconsciously from myriad sources. Even if the headline is not consciously registered, it may well be stored away in the depths of our brains to be used as fodder for ultimate evaluation of whether the brand is one we want to be associated with or not. This accidental informing of our opinions is not likely to happen on twitter. To add to this, these negative headlines are absorbed in the absence of any balancing positive information. If the only unconscious information we are absorbing about the brand is this negative stuff, then it is likely that our positive emotional opinion of the brand will be eroded. Not immediately, but over time. It’s nice to think we can manage the world online: a world in which we can control from a dash-board everything our specific “target” (as metrically determined by unending data mining and on-line behavioral correlations) sees and learns about our brand. And then we can “interact” with them, set them straight on misinformation that accidentally seeps through the cracks in our “relationship”. But this is not the world we live in. Punters (customers in Englandish), are constantly subjected to messages out of our control in the real world they inhabit. and by abandoning the real world in favour of total focus on the digital world, we open ourselves up to the kind of damage this story has probably done to brand Marriott.